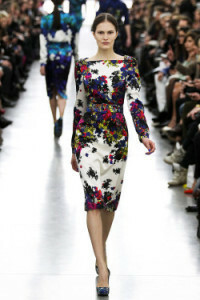 Erdem’s A/W 2012 collection in London, must have been beyond your expectations. The common look for all 38 pieces were a set of trendsetting patterns. Most of them flower prints, yet not too girly. The petal decorations were based off a black and colored duo. The gorgeous deep colored decorations went along brilliantly with the black based garments. We also shouldn’t miss the color mixed check patterns. We fell in love with elegant and lovely check dresses, but the shoes would have to be the ultimate must have items this fall! If you like black and monotone looks, the check shoes would certainly be a considerate buy. 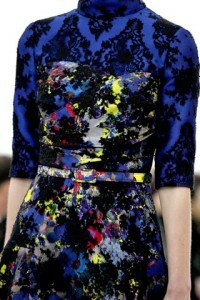 High neck, tight waist, knee length are just a few trends to keep an eye out for in this collection. Now for hair, contrary to the clothes and shoes which cause you to imagine it’s spring or summer, th hairstyle for this conllection is quite simple and refined (yet not too natural nor straggling). The makeup is quite likable as well. The eye makeup is very feminine and natural yet it makes it's statement.